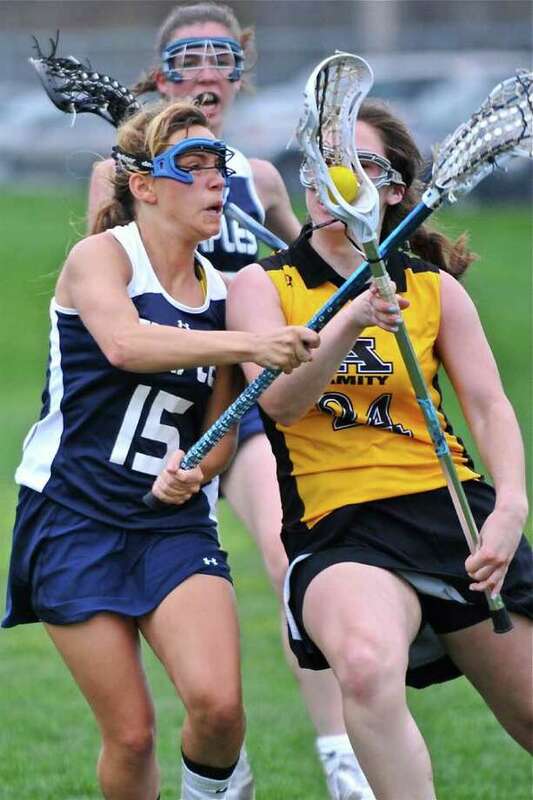 Staples junior Ali Crofts had four goals and an assist Wednesday in a 20-9 victory at Amity. 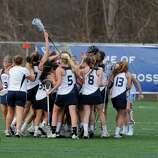 The Staples girls lacrosse team continues to show signs of becoming a powerhouse at the right time. Staples raised its record to 8-0 with a convincing 20-9 win at Amity Wednesday and is feeling good about its play going into today's 4 p.m. showdown at 6-1 Greenwich, who was last year's Division I runnerup. "After an uneven start, they did a really nice job of controlling the game," Lady Wreckers Coach Cathy Schager said. "From grabbing draw controls to being disciplined on goalie clears and working together in offensive and defensive transition, it was really a pleasure to watch. The key was dominating draw controls and ground balls. That created numerous opportunities for the other key, which is our offense. We have many threats; these girls work together very, very nicely. They love to set each other up and they do some really pretty things." Senior quad-captain Nikki Seo led the attack with six goals. Seo also had two interceptions. "I've been having trouble with my shots and Coach Schager said to constantly change up where I shoot and not to always shoot too high or too low," Seo said. "I tried my fakes and I'm finally clicking." Staples clinched a Class L playoff berth with the win. "We're all so pumped and we've doing so well and we only expect to get better," Lady Wreckers senior quad-captain Elizabeth Driscoll said. "It's exciting." Amiy's defense focused on stopping junior Maeve Flaherty, who had three goals and one assist. Flaherty helped Staples control the ball with 14 draw controls, six ground balls and three positive turnovers. Junior Ali Crofts (four goals, one assist, two ground balls, three draw controls) and Driscoll (three goals, one assist). Driscoll (eight ground balls, two positive turnovers) were productive on offense. "The key to our success is trusting each other on offense, staying calm and working on plays," Seo said. Junior Adele Mackey also hustled and won the battle for loose balls with nine ground balls. Mackey also had two goals, two assists and two positive turnovers. 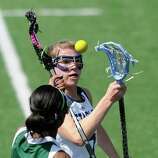 Classmate Jessie Ambrose (two goals, two assists, two ground balls, one draw control). Performing like a playmaker was junior Remy Nolan with five assists. Nolan (four ground balls, one interception, three draw controls) also helped the Lady Wreckers possess the ball. Senior quad-captain Penny Tsilfides had four saves for Staples. In order for the Lady Wreckers to beat Greenwich, which will move them closer to elite status, they need to pick up their play a few levels. 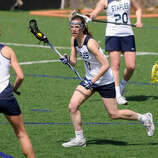 Although the Lady Cardinals are the favorites going in, today's showdown isn't a done deal as Staples showed in its 14-13 win over defending Division I champion New Canaan April 11. "We were able to work on controlling tempo and really executing our defensive transition, as well as offensive transition and a variety of scoring methods," Schager said. "All of those things should help. As for heading into Greenwich, we are excited. They are obviously a very strong team and we've been looking forward to the opportunity to play them this year." Working in the Lady Wreckers' favor is that they never looked ahead but still plan to be ready. "Every win is important to us and the more our team works together will help us," Seo said. "I tried not to look too far ahead for our next game but now that it's here, I'm eager to get on the field. I can't wait until Friday and we'll see how it goes." Driscoll said, "We look at every game, one game at a time. Amity is in the past and we hope to try our hardest against Greenwich. We have to bring our "A" game the entire time. We did well in the second half the last two games and we need to play the entire game. We had more ground balls in the second and we have to be more aggressive throughout." Staples needs to limit the adversity it faces. "Greenwich has a tough reputation to overcome but Coach Schager has done a good job and is having us play our game," Seo said. Schager said, "We need to play a full game - two halves, preferably not in a "player-down" situation or from a five-goal deficit like we did against New Canaan. Possession will be everything; we're really going to have to play our best in every aspect of the game - settled and transition offense and defense." In years past, the Lady Wreckers would consider it to be a moral victory if they turned in a respectable performance in a loss to the Lady Cardinals. Staples has much higher expectations than it had in the past. "We're hoping for a real victory," Driscoll said. "It won't be easy but it's more doable than it was in previous years."